Ecco il report della gara di Wyn a Brook a Levin per la terza ed ultima del campionato North. Sabato inizia il campionato South. Thursday morning we loaded up the van with 5 of the boys and headed down from New Plymouth to Levin, on the thursday before the event, riding all the skateparks on the way as we made our way down. Some Bowls were aired and some manuals were done, and it was fun times all round. After that we headed up to check out the track, it looked great nice and fast and very dry although maybe a little straight. Next day was Race day, the weather was perfect again and really hot, I seeded 7th with a bit of a lazy run i was struggling with all the pedalling. And also my team mate Brook had a crash and was not happy with his time. So for the next run i took it a lot more serious and did a proper warm up, i felt a lot better at the start and was straight in to the run going hard. Although i came in a little fast in to one of the off camber sections and spun 180 degrees ended up pointing back up the hill, but turned round and kept pushing to see how my time would be. 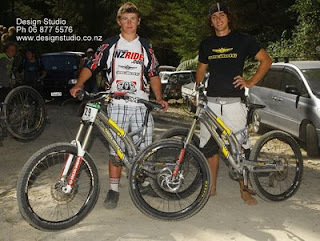 I ended up in 7th place with 3 mins 09 seconds, 8 seconds behind the winner Sam Blenkinsop. I was annoyed with myself to have made the mistake, but still happy with how i was riding. And I wasn't far off the pace with the crash so, Im looking forward putting a run together this coming weekend In Dunedin, where we will be racing for the first round of the South Island series. My team mate Brook also had bad luck with a crash in pretty much the same spot as me. Many riders had a crash in this section as it got very Slippery for the race runs. But for now i have a 9 Hour drive and yet another hard week of training to look forward to.